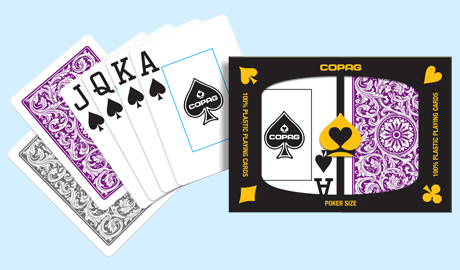 New Copag 1546 Gray and Purple Back Playing Cards are 100% plastic. These Playing Cards come in a 2-deck set featuring poker/wide size cards with super index numbers. Red/Blue, Green/Brown, and Black/Gold Copag Plastic Playing Card Sets are also available. These other Copag Sets come in both wide and narrow size, with regular and large size numbers. For additional information or wholesale pricing on Copag 1546 Gray and Purple Plastic Playing Cards, please contact us at 1-800-233-0828.